Learn Chinese with Mike, the revolutionary Mandarin Chinese course. It’s taught through the highly entertaining and effective videos by me, Mike Laoshi. Each of my 120 lessons, which were taught in my spiffy garage, is comprised of a 10 – 15-minute video. You should learn Chinese with Mike because, as someone who had to learn Chinese, I understand which parts of the language learners struggle with, so I reveal all my insider tips that make learning it easier (and some say I’m the best Chinese teacher in the world!). I started my teaching life as an English instructor in Taiwan and went on to gain my Chinese Teaching Certificate from the Confuncius Institute. I have since taught at, and developed course materials for, the University of Chicago and Prairie State College. I currently teach Mandarin Chinese at Joliet Junior college in Illinos. My other classroom is, of course, my garage at home which is where I will be for the addictive Chinese with Mike video lessons that make up this course. In addition to the videos, Chinese with Mike includes corresponding coursebooks, activity books, and audio with native speakers. You should learn Chinese with Mike because my method is fun and effective. I never found a great textbook during my own Chinese studies. Sure, some books had good lessons here and there, but for the most part, they were boring and difficult to follow from one chapter to the next. Chinese with Mike is NOT a survival guide with random information flying at you from all directions. Instead, it’s a solid foundation that teaches you how to speak Chinese and also understand how the language fits together. Using my witty sense of humour, mixed with a logical, step-by-step approach, I shield learners from unnecessary complexities of Chinese so you can focus on the important stuff. Basically, this is the course I wish I had when I was starting out. Some people even call it addictive. Why will it be easier to learn Chinese with Mike? My video-based method is a fan favourite and is backed by university professors. I’m told it’s incredibly funny and I know it’s amazingly effective. Plus it’s serious learning. The lessons break down the language into short chunks delivered with energy, passion and humour. 120 videos of Chinese with Mike language learning brilliance! There aren’t enough superlatives to describe this bundle, just be prepared to take yourself, in no time at all, from an absolute beginner to a confident Mandarin speaker in a blaze of bandanas, Hawaiian shirts and shades. So, learn Chinese with Mike, and join me in my garage turned classroom as I don my Hawaiian shirt, grab my marker pen and get serious about speaking Chinese! 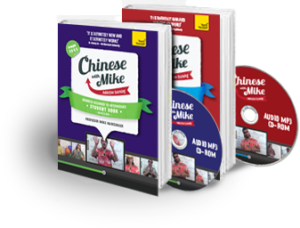 If you’re addicted and want to learn Chinese with Mike than can be found on the videos, you can also buy the corresponding coursebooks (complete with audio featuring native speakers) and activity books which are the perfect supplement to your learning. Find out what’s inside.